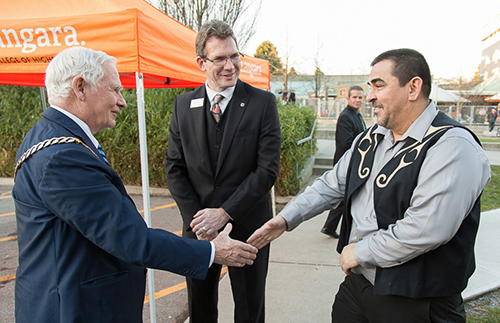 Langara acknowledges its location on the unceded traditional territory of the Musqueam First Nation, and is working to strengthen the connections between the Musqueam people and the College in a number of ways. Langara was honoured to receive a name from Musqueam in their language, which means house of teachings. The word is used to reference the advice given to a child to build their character and to guide them in to adulthood. The naming ceremony, on January 11, 2016, was led by Langara Elder in Residence Gail Sparrow and Musqueam Siem Henry Charles, and was attended by Musqueam Chief Wayne Sparrow, Grand Chief Edward John of the First Nations Summit of BC, the Honourable Andrew Wilkinson, Minister of Advanced Education, Vancouver Mayor Gregor Robertson, Langara President and CEO Lane Trotter and Board Chair Kwin Grauer, along with Langara board members, students, faculty and staff. Read our news story and social media summary. Check out our photo album from this special day. Watch highlights from the event (length: 4:37). As part of the ceremony, Musqueam gifted Langara with a rock from one of their original village sites. The College has placed a plaque on this rock at the centre of campus to acknowledge our location on Musqueam traditional territory and the name they have given us. On September 26, 2018, Langara installed a locally carved Musqueam house post that sits in the northwest corner of the campus. The 14-foot welcome figure, carved of red cedar by Musqueam artist Brent Sparrow Jr., was carved for the College. It welcomes all visitors to the traditional unceded territory of the Musqueam People on which Langara resides. The welcome figure, who is wrapped in a blanket, holds a spindle whorl. The whorl is a traditional tool used for making blankets and clothing, and represents the passage of knowledge to the next generation. The house post honours the passing of Si?ém Henry Charles, who was a great friend to Langara, and led the ceremony on January 11, 2016 that granted the College its Musqueam name, snəw̓eyəɬ leləm̓. View a video of the house post unveiling. On June 4, 2014, Langara installed its third President and CEO, Dr. Lane Trotter. As part of the installation ceremony, Musqueam gave him a name in their language – Takaya, which means wolf. In 2015 the President’s regalia was altered to incorporate traditional Musqueam blanket patterns and wolves, as designed by Musqueam artist Debra Sparrow. After a number of years of development, in January of 2015 His Excellency David Johnston, Governor General of Canada bestowed on Langara its first Coat of Arms. Among the symbols incorporated in the arms is a bed of river grass to acknowledge Langara’s location on Musqueam territory, Musqueam meaning people of the river grass. Musqueam Chief Wayne Sparrow and Elder Shane Point were on hand to welcome His Excellency to their traditional territory. Check out the photo album from this event.